Summary: "Mature" women pose for a very special calendar. Station: Stephanie Watson, KDKA Channel 2 Airtime: 2 minutes, 24 seconds on March 5 Visuals: * Four of the risqué models seated tightly next to each other on a sofa, holding hands. Highlights: * When anchor Ken Rice prepares us: "They're in their 60s, 70s and 80s, but they're not letting their ages stop them. A group of brave women from the Mon Valley have decided to bare a little skin, all in the name of charity." * When Watson elaborates, "The 'Vixens of the Valley' are back in action after the success of their first calendar in 2008 [made them] globally known, including an appearance on Japan public television. But with their new calendar, they've decided to ask the men to join in and spice things up a little bit." * When 83-year-old Ms. January says, "With ladies our age, they don't want to see too much -- so we plan it so it's just funny." * When Watson adds, "[Ms. January] says the ladies and lads of the Mon range in age from 65 to 87 years old, and they just started their first of many photo shoots." * When Ms. November, 72, describes the fantasy scenario depicted in her photo: "I put on my little nurse's cap and we went to the exercise room and I'm taking his blood pressure and checking his pulse." * When Ms. January coyly reveals, "I'm wearing pearls, I'm wearing furs. I might be drinking a glass of wine, might be Welch's grape juice." * When Mr. January, who will be posing with Ms. January, discloses, "I'm not sure right now what I'm going to be wearing -- but I won't be overdressed." * When Ms. January speaks excitedly, "And [one] that's really way out is [a man named Phil]. He wants to be a vampire. We're going to photograph him up in an old cemetery with [the CEO of our chamber of commerce]. She'll be the sweet young thing that he's vampiring." * When Watson wraps up, "They sold 3,500 copies in 2008 and raised $15,000. They're hoping to raise even more the second time around, and the proceeds this time will benefit the Monongahela Area Library and their chamber of commerce." What We Learned: That these sweet, lovely ladies have no idea what "vampiring" means. (Check your Urban Dictionary, ladies!) Unanswered Question: Who's thirsty for Welch's grape juice? News Value: 6. I love this community's take on the original "Calendar Girls" -- women from Yorkshire who took it all off to raise money for charity. 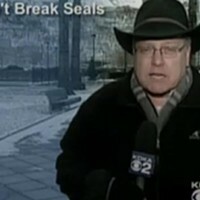 Kudos to KDKA for not over-sensationalizing an easy target and simply telling the naked truth.